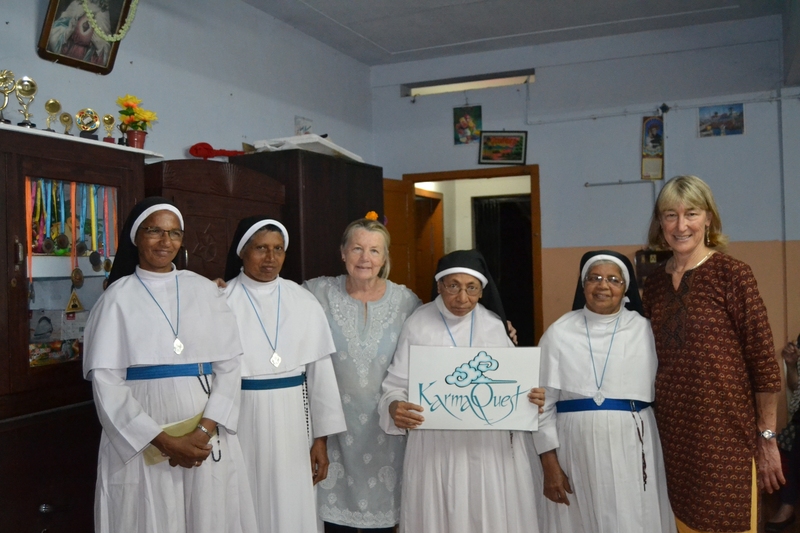 Sponsoring South Indian orphan girls' education. Supporting women weavers in Sikles. helps conservationists better manage human-elephant conflicts. for local people like Mr. Wanasinghe. by KarmaQuest and its guests. on every trip for the past decade. Albert provide dental care for Nepali orphans. KarmaQuest partners with non-governmental organizations (NGOs) and community-based non-profits around the world that are working to conserve the natural environment and cultures and to improve people's lives in the places we visit. We invest financially and in other ways (e.g., donations of equipment, assisting in developing networking contacts, leadership and capacity building, etc.) in these partners, helping them manage the impacts of tourism and address basic health and ecomomic needs of local communities. Our trip members visit partner NGO projects to learn more about their work, and so that our guests can contribute through purchases, memberships and/or donations. The small village of Sikles in the Annapurna region became Nepal’s first designated ecotourism destination in the 1990s. The charming hillside village still warrants that label. Here, the Gurung people carry on many of the traditions described in the Sikles Gurung cultural museum, the only such in Nepal. Yet Sikles is anything but backward. Children receive an excellent primary through high school education and some go on to earn college – even advanced degrees abroad -- and return to lead Nepal toward a promising future. Sikles is also the birthplace of Dr. Chandra Prasad Gurung, one of Nepal’s conservation leaders in whose name the -- Chandra Gurung Conservation Trust (CGCT) was founded. Ecotourism is a two-way experience and KarmaQuest is committed to “giving forward” to the places it visits. 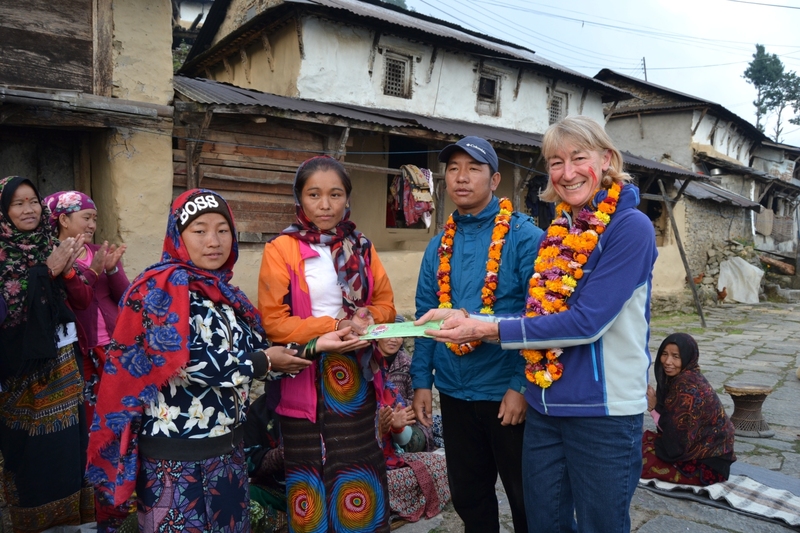 In October 2018, a KarmaQuest group of women trekkers visited Sikles and made a generous donation, supplemented by CGCT, to women weavers to purchase a new loom. The weavers plan to expand their production of fine allo cloth – a linen-like fabric made from the hand-processed fibers of the stinging nettle plant. Proceeds from the sales will help support a waste management program, and in time a childcare center to give the Sikles youth a head-start. CGCT and its sister organization in Nepal, the Chandra Gurung Conservation Foundation (CGCF), are exploring ways to train the weavers in enhanced design and marketing of their products. As Chandra knew so well, empowering village women pays forward many times in community and conservation benefits. Please join us on a trip to Sikles and help uphold Chandra’s vision for Sikles as a model village that embraces its past while investing in a future of sustainable development. The human footprint extends further into the wilds than ever before. A growing world population, climate change, expanding infrastructure, and tourism are but a few reasons why. With a commitment to sustainable tourism, KarmaQuest strives to reduce, manage and mitigate the impacts of our trips and travelers on the natural environment. We follow protective wildlife viewing norms and support community-based conservation initiatives that help local residents tolerate their losses from wildlife and crop depredation (e.g., loss of livestock or trampling of fields by protected wildlife) by earning income from wildlife tourism, among other benefits. For example, by participating in our Wildlife Safari trip to Sri Lanka (see below) you will be helping to provide farmers living near Yala National Park with night-time cattle enclosures that has reduced the loss of cattle and the retaliatory killing of leopards (that wander outside the park) to almost zero, allowing farmers to increase their herd sizes and income. Human elephant conflict is the biggest challenge confronting Asian elephant conservation, according to the Centre for Conservation and Research. Most elephants live outside protected areas. With expanding human populations, natural habitats that are not designated as “protected” are being developed or farmed at a rapid rate, intensifying the interaction between people and elephants. 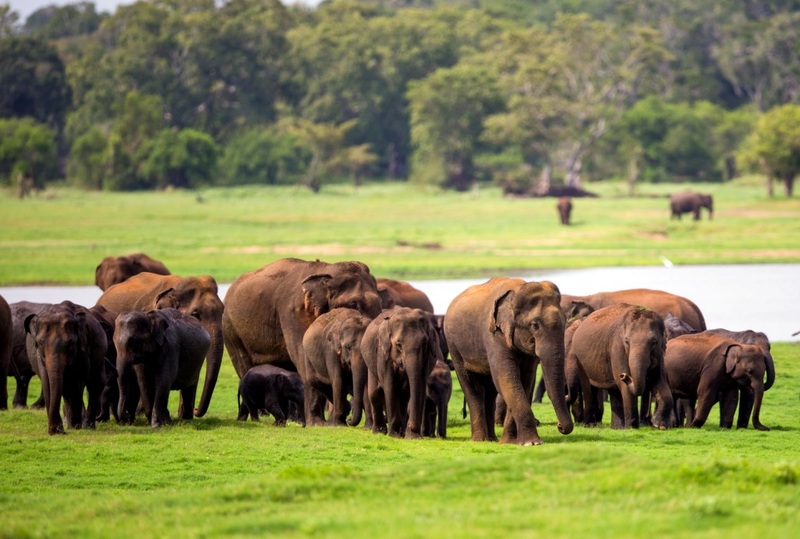 Currently such interactions are resulting in the death of around 160 elephants and 50 humans in Sri Lanka annually. Data collected on the movement of elephants after their coming together at the dry-weather watering hole at Minneriya National Park inform a “new elephant conservation strategy” to mitigate conflicts between elephants and villagers. Please read more. 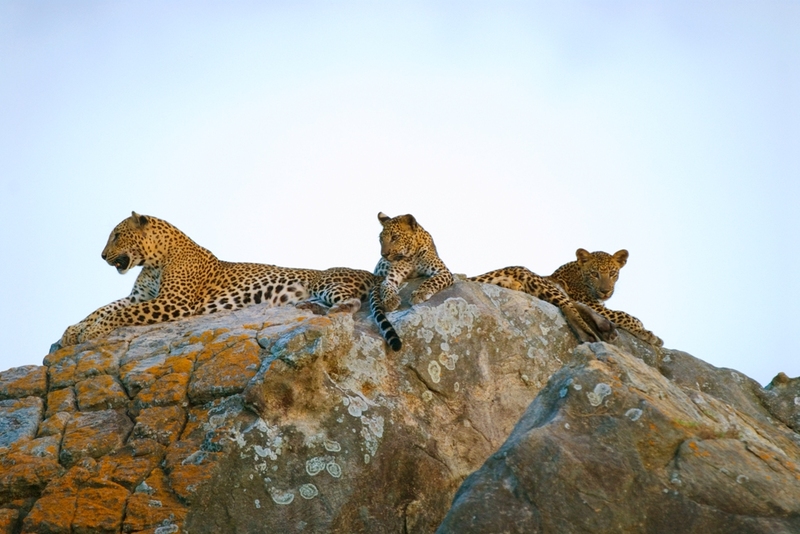 Our Wildlife Safari, Featuring “The Gathering” will be there to experience this amazing event first-hand. * Through these practices some have earned Green Globe certification. Thank you for supporting sustainable tourism. Please read about some of KarmaQuest’s other conservation actions on this page. Please inquire as well. Together we can make a difference! Every KarmaQuest trip to Burma donates to a worthy social cause, of which there are many. Emerging from decades of undevelopment and political repression, many rural communities struggle without decent health care, education, and the recognition of basic human rights, particularly among women, children, and ethnic minorities. Thousands of children were orphaned during the horrendous Cyclone Nargis in 2008. Human trafficking is also a real threat among the poor. •	Better teaching materials, teacher training, improved classrooms and play areas for primary school children. •	Nursery facilities for younger brothers and sisters, allowing older siblings to attend school. Please read more about Parners Asia's work in Burma/Myanmar, and about a 2015 KarmaQuest visit to the villages we help support. For more than a decade, KarmaQuest has worked closely with the Snow Leopard Conservancy (SLC) in Ladakh, India to promote sustainable wildlife and homestay ecotourism. Our Wintertime and Summertime Quest for the Snow Leopard are possible only because of SLC’s many years of research and collaboration with local communities to help make the snow leopard a treasured asset rather than a hated pest. KarmaQuest joins once again with Snow Leopard Conservancy and now with Bhutan Foundation to offer a Trek for Snow Leopard Conservation in Bhutan. This inaugural trek coincides with a mountain festival for snow leopards as part of a pilot program that helps communities co-exist with snow leopards. An extensive recent assessment of snow leopards in Bhutan counted 96 individual cats. See the coverage and a video of camera trap images here. The Snow Leopard Conservancy and its partners use a strategic two-pronged approach to resolve human-wildlife conflicts and encourage protection of wildlife. Both approaches are hinged on a participatory process that builds local stewardship of the snow leopard. In Ladakh, India, Hemis National Park provides valuable habitat for at least 20-30 of these endangered cats. SLC conducted village meetings with communities living in the Park to help them reduce the threat of snow leopards killing their livestock. The villagers suggested that improved livestock management including predator-proofing their night-time corrals would help reduce snow leopard depradation. They contributed materials and labor while SLC provided technical support and funds for materials. The second step in the strategy sought to make up for economic losses of livestock kill by helping villagers to take on tourism as a supplemental income-generating activity. Homestays and wildlife tourism provide incentives that give value to protecting snow leopards from harm. Villagers have also set up eco-cafés managed by local women’s groups, solar showers and pack animal services. 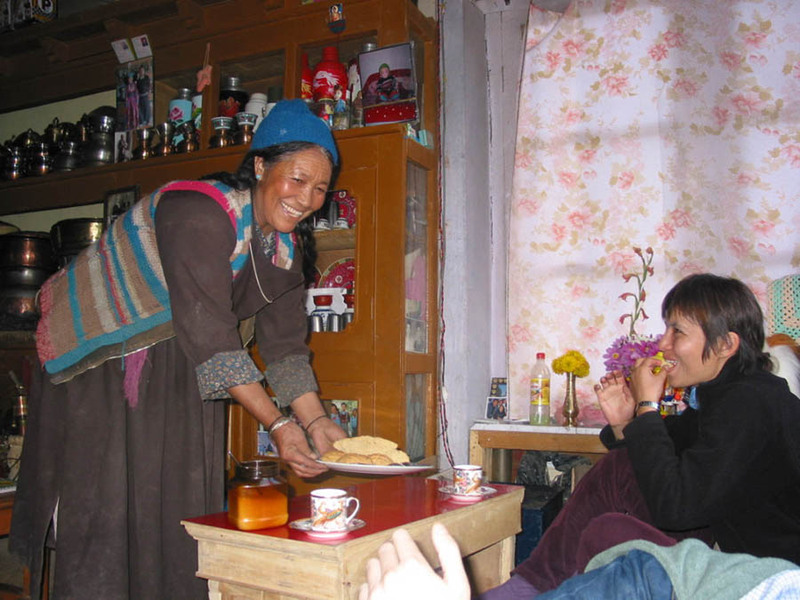 Under a 2002-07 UNESCO program, KarmaQuest’s Wendy Lama as an Ecotourism Specialist advised these Ladakhi communities in developing a village homestay program called Himalayan Homestays. Visitors now overnight in homestays where they experience Ladakhi culture. Homestay families have stopped harming the snow leopards that once killed their livestock. KarmaQuest’s snow leopard trips to Ladakh help fuel this win-win scenario, contributing over $36,000 to SLC’s work in Ladakh. KarmaQuest's trips have been recognized as exemplary of environmentally responsible travel that contributes to conservation and social benefits by a number of international organizations and media including the Trip of the Year award from Outside Magazine. In October 2013, Dr. Loree Bolin of Edmonds, Washington and her team provided dental check-ups and treatment for some 60 Nepali orphan children and 72 teachers, alumni and others in the girls' rec room at Paropakar Orphanage, organized and assisted by Virtues Children Nepal (VCN) on whose Board KarmaQuest's Wendy Lama sits. Working over children age 5 to 17 -- who reclined in chaise lounge chairs that Dr. Bolin brought to Nepal with her -- the team cleaned, filled, pulled and fluoridated teeth, performed rootcanals, and placed sealants in mouths many of which had never before opened to a dentist. "We were pleased to be joined by the talented orphanage staff and local friends who helped in the clinic, working with us to organize and document patient care, sterilize instruments, assist in dental care and in patient pharmacy needs. Being offered tea and biscuit breaks when they were most needed was always a wonderful surprise. The clinic was provided for 3.5 full days. To promote preventative health care each was provided a toothbrush and case, toothpaste, floss and home care instruction," said Dr. Bolin. Dr. Bolin serves is a founding member of Health and Hope Foundation and besides Nepal, has provided clinical leadership for mission sites in Haiti, Honduras, Tanzania, Uganda and the Philippines. Fellow trekkers and friends Leslye Teuber, David Albert, and Anne Maleady assisted Dr. Bolin in the dental work. KarmaQuest had donated a trip to Nepal to help raise funds to construct the girls' orphanage, opened in 2009 and now managed by Paropakar, Nepal's oldest orphanage. Many KarmaQuest guests visit the girls'and boys' orphanages and some choose to support a students' college education with a much appreciated donation to VCN. Besides providing educational sponsorships to Paropakar high school graduates, VCN supports a number of other programs benefitting disadvantaged children in Nepal.